The Purple Passion or Purple Velvet Vine is a trailing, evergreen perennial that was originally discovered on the island of Java in Indonesia. Unfortunately, Purple Passion Plants are only hardy in USDA zones 10-12, so their most common use is in hanging planter, growing as house plants. In the garden, plant your Passion Vine in an area where it will receive some shade from the hottest, mid-day sun. It should be grown in a rich, slightly acidic, well-drained soil.Keep the soil evenly moist during the growing season. The vines are capable of growing up to 8 feet in length but will lose much of their bright purple coloring. To retain the rich purple coloring, keep them trimmed to a length of 3 ft. or less. Pinching the tips will result in a much fuller plant. Fertilize monthly during the growing season with a balanced fertilizer. 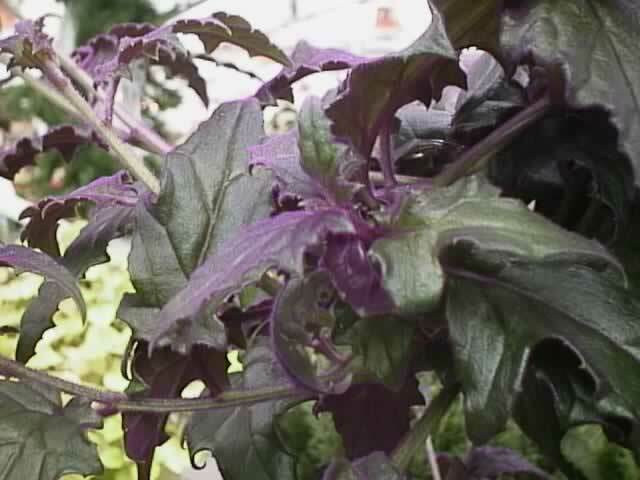 Purple Passion Plants need bright light for the brightest coloring but they must be protected from hot afternoon sun. They prefer a slightly acidic soil mixture, so you should use a soil mix consisting of 2 parts peat moss to 1 part potting mix and 1 part coarse sand. The soil should be kept evenly moist at all times during the growing season. Feed every 2-3 weeks with half-strength house plant food when the plant is actively growing. Pinching the tips regularly will help produce a fuller plant. Purple Passion Plants produce yellowish-orange, 1" flowers in mid-summer. so you may want to remove them in their bud stage. During the dormant winter period, light and watering can be reduced slightly. Leggy vines should be cut back to 3-4 nodes to produce a much fuller plant the following spring. Purple Passion Plants can be easily propagated by taking softwood cuttings containing two stem nodes each, from actively growing vines. Plant several cuttings directly into a six or eight inch pot, filled with the potting mix mentioned above. Place the potted cuttings in a warm, brightly lit area.